Flight 714 (1968) , is the interrupted voyage, the hijacking which will turn everything upside down, Tintin and his friends' foray into the unknown, in a surreal world highlighted with telepathic phenomena. It is also the incredible contact with extra-terrestrials and the emerging from a dream ... or is it a dream?? Jakarta, the last stop for the Boeing and flight 714 en route to Sydney. One builds aircraft, so does the other. One is known for never laughing, the other is too. One wears a hat, a scarf and glasses, so does the other. As you understood, there is an obvious resemblance between Laszlo Carreidas and Marcel Dassault. Hergé would certainly have admitted this fact if one had asked him. This is one of the greatest gags of the album. What makes it unique is that it develops over three pages. The paroxysm is the discovery, by Captain Haddock, of the surprising effects that Sani-Cola - a soda based on chlorophyll made by Laszlo Carreidas - inflicts to plants. In Studios Hergé, everyone knew that Roger Leloup was second to none when it came to drawing airplanes. For this reason, Hergé gave to the future "father" of Yoko Tsuno the responsibility to create the Carreidas 160, a supersonic swing-wing tri-reactor. The view of a section published in Tintin magazine revealed to the readers all the secrets of the aircraft. 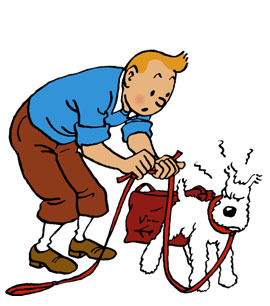 When the enigmatic statue which swivels to let Tintin and the fugitives escape, had to be created, Hergé used the technique he had experience with the rocket. He had a model built and based on a single picture he possessed. As one can see, this technique is quite successful. By Jove, what a nose! As the last scientist who will cross paths with Tintn and his friends, Mik Kanrokitoff owes his telepathy and hypnosis knowledge to the particular relationship he maintains with extra-terrestrials. To create this strange individual, Hergé was inspired by Jacques Bergier, a well-respected specialist of paranormal phenomena and who worked with Louis Pauwels for the "Planète" magazine and encyclopedia. In Flight 714 for Sydney, Hergé decided to demystify the Adventure with a capital A. The bandits, who look more ridiculous than dangerous, will be the victims of this decision. An example perhaps? The scene during which Rastapopoulos, all scruffy and covered with bumps, throw a big tantrum as, deprived from denture, Allan bursts into a lisp as if there were no tomorrow. It ain't over 'till the fat lady sings, but maybe it should have been after The Castafiore Emerald. Probably the best thing about Flight 714 is the graphics, likely the handiwork of Herge's assistants? New character Laszlo Carreidas is to awareness what Calculus is to hearing - which makes for some comical interchange. Haddock reverts back to his doubting Thomas ways (even after experiencing telepathy himself) so the 3 stooges are a bit too much weight to carry in one adventure. A lot of holes in the story, indeed it is a confirmation that Classic Tintin died in Tibet.